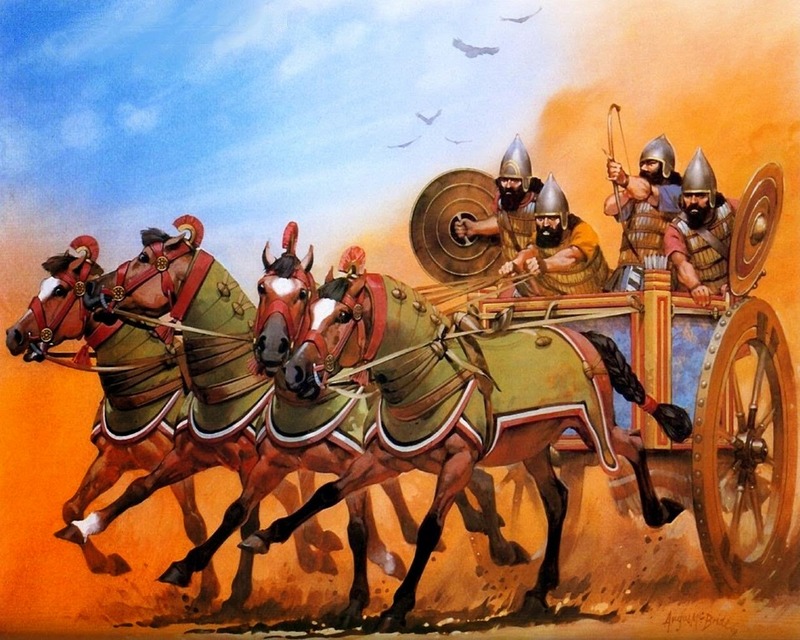 The Hittite Chariot heavier with 3 men: driver, lancer, archer….effective but less maneuverable…..Notice the four spokes wheel. The last kings of the Hittites—especially Tudhaliya IV (1237–1209 BC) and Suppiluliuma II (1207–? BC)—were very active during the last quarter of the thirteenth century, from ca. 1237 BC, even as their world and civilization were showing signs of coming to an end. Tudhaliya ordered that an entire pantheon of gods and goddesses be carved into the rock of a limestone outcrop at Yazilikaya (“Inscribed Rock”), along with a representation of himself, just a kilometer or so from the Hittite capital city of Hattusa. At this time, the Hittites were at war with the Assyrians in Mesopotamia. In a discussion of Assur-uballit I, who ruled over Assyria at the time of the Amarna pharaohs, and who had sacked Babylon after a marriage alliance between the two powers went awry. The Assyrians, after a brief period of relative dormancy following the reign of Assur-uballit, had become resurgent under their king, Adad-nirari I (1307–1275 BC). Under his leadership and that of his successors, the Assyrians emerged as a major power in the Near East at the beginning of the thirteenth century. Among his other accomplishments, Adad-nirari I fought against the Mitannians, capturing Washukanni and other cities. He placed a client king on their throne and extended the Assyrian Empire sufficiently far to the west that it now bordered the Hittite homeland and almost reached to the Mediterranean Sea. 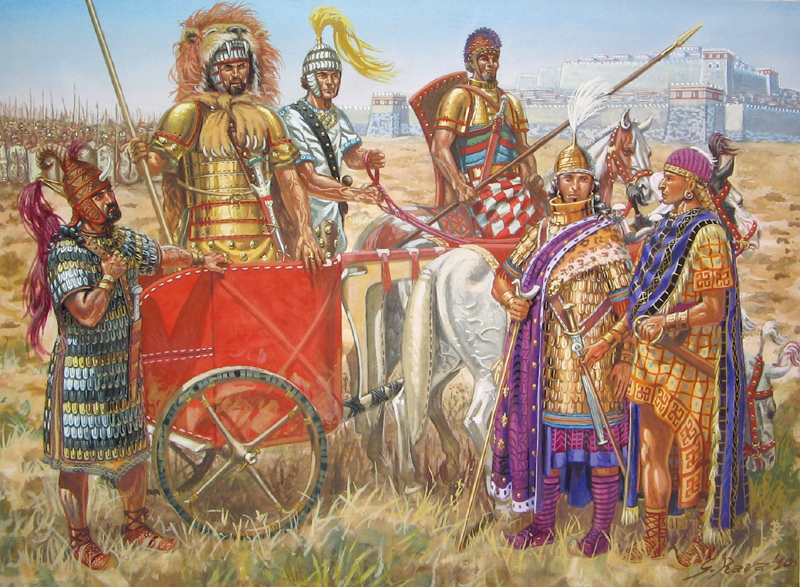 This may not have been as difficult as it sounds, however, since the Hittites under Suppiluliuma I had already inflicted a crushing defeat upon the Mitannians several decades earlier. Following the reign of Shalmaneser I (1275–1245 BC), who continued many of the policies of Adad-nirari and may finally have brought the Mitannian kingdom to an end, one of the greatest of Assyria’s “warrior kings,” Tukulti-Ninurta I, who ruled ca. 1244–1208 BC, stepped onto the world stage. He followed in the footsteps of Adad-nirari but was perhaps also emulating his predecessor of the previous century, Assur-uballit, when he decided to attack Babylon. However, Tukulti-Ninurta I surpassed Assur-uballit’s achievements: not only did he defeat the Kassite Babylonian king Kashtiliashu IV in battle and bring him to Assur in chains; he also took over their kingdom by ca. 1225 BC, ruling as king himself before installing a puppet king to govern on his behalf. But this was not a particularly successful move, since the puppet king, Enlil-nadin-shumi, was almost immediately attacked and overthrown by an Elamite army marching from their eastern homelands on the Iranian plateau, in what is now southwestern Iran. It would not be the only time that this happened, for we shall encounter the Elamites again soon. In addition to his other achievements, Tukulti-Ninurta I, the Assyrian warrior king, also defeated the Hittites under Tudhaliya IV, thus dramatically changing the balance of power in the ancient Near East. It has even been suggested that he became so powerful that he sent a mina (a Near Eastern unit of weight, probably the equivalent of a little more than a modern American pound) of lapis lazuli as a gift to the Mycenaean king in Boeotian Thebes on mainland Greece, all the way across the Aegean. Consequently, by the time of the first Sea Peoples attack on the Eastern Mediterranean in 1207 BC, just one year after Tukulti-Ninurta was assassinated by one of his own sons, Assyria had been one of the major players on the international scene in the ancient Near East for nearly two hundred years. It was a kingdom linked by marriage, politics, war, and trade over the centuries with the Egyptians, Babylonians, Hittites, and Mitanni. It was, without question, one of the Great Powers during the Late Bronze Age. If the King of Egypt is the friend of My Majesty, he shall be your friend. But if he is the enemy of My Majesty, he shall be your enemy. And if the King of Babylonia is the friend of My Majesty, he shall be your friend. But if he is the enemy of My Majesty, he shall be your enemy. Since the King of Assyria is the enemy of My Majesty, he shall likewise be your enemy. Your merchant shall not go to Assyria, and you shall not allow his merchant into your land. He shall not pass through your land. But if he should come into your land, seize him and send him off to My Majesty. [Let] this matter [be placed] under [oath] (for you). In our study of the ancient world, there are two items of special interest in this mutual-appreciation treaty. The first is that Tudhaliya IV says to Shaushgamuwa: “[You shall not allow(?)] any ship [of] Ahhiyawa to go to him (that is, the King of Assyria).” This is thought by many scholars to be a reference to an embargo. If so, although the embargo is usually thought to be a fairly modern concept, it seems that one may have been put in place by the Hittites against the Assyrians more than three thousand years ago. The second is the fact that, a few lines earlier, Tudhaliya IV had written, “And the Kings who are my equals in rank are the King of Egypt, the King of Babylonia, the King of Assyria, and the King of Ahhiyawa.” The strikethrough of the words “King of Ahhiyawa” is not a misprint in this book; it is a strikethrough found on the clay tablet of Tudhaliya IV. In other words, we have here a rough draft of the treaty, in which items could still be deleted, added, or edited. More importantly, we are in possession of an item that indicates that the king of Ahhiyawa was no longer considered to be equal in rank to the other major powers of the Late Bronze Age world: the kings of Egypt, Babylonia, and Assyria, and of the Hittites. It is reasonable to ask what had happened in the Aegean, or on the western coast of Anatolia, to cause this state of affairs. It must have been a fairly recent occurrence, for recall that in the reign of Hattusili III, Tudhaliya IV’s father, the king of Ahhiyawa had been referred to as a “Great King” and as a “brother” by the Hittite ruler. Perhaps a clue can be found in one of the Ahhiyawa texts, known as the “Milawata Letter.” Dating most likely to the time of Tudhaliya IV, the letter makes it clear that the city of Milawata (Miletus) and its surrounding territory on the western coast of Anatolia, which had once been the main footprint of the Mycenaeans in the area, no longer belonged to the Ahhiyawan king but was now under Hittite control. This may have meant that the king of Ahhiyawa was no longer a Great King in the eyes of the Hittite king. However, we should consider the possibility that the Hittite king’s “demotion” of the Mycenaean ruler may have been the result of some event of even greater magnitude, perhaps something that had happened back in the Aegean—that is, on the Greek mainland. In the meantime, while all of this was going on, Tudhaliya IV decided to attack the island of Cyprus. The island had been a major source of copper throughout the second millennium BC, and it is possible that the Hittites decided to try to control this precious metal, so essential to the creation of bronze. However, we are not certain about his motivation for attacking Cyprus. It may instead have had something to do with the possible appearance of the Sea Peoples in the area or with the drought that is thought to have occurred in the Eastern Mediterranean at this time, as indicated by new scientific discoveries as well as long-known texts that mention an emergency shipment of grain sent from Ugarit in north Syria to the port city of Ura in Cilicia (located in southeastern Turkey). Clearly, Suppiluliuma was successful in his naval attacks and perhaps in the invasion of Cyprus, but it is unclear why he had to fight and invade the island again, after Tudhaliya IV had already captured it. His attempt might simply have been to gain (or regain) control of the sources of copper or of the international trade routes in increasingly tumultuous times. But we may never know. It is also unclear where the final land battle was fought; scholars have suggested both Cyprus and the coast of Anatolia as possibilities. Upon assuming the throne following the death of his father, Suppiluliuma II had taken the name of his famous fourteenth-century BC predecessor Suppiluliuma I (though the new king’s name was actually spelled slightly differently: Suppiluliama rather than Suppiluliuma). Perhaps he hoped to emulate some of his predecessor’s successes. Instead, he ended up presiding over the collapse of the Hittite Empire. In the course of doing so, he and the Hittite army, in addition to invading Cyprus, campaigned in western Anatolia once more. One scholar notes, in a recent article, that many of the documents dated to the time of Suppiluliuma II “point to a growing instability within the Hittite capital and a growing sense of mistrust,” though perhaps “unease” would be a better word to use, given what was soon to come. This entry was posted in Ancient Warfare, History by MSW. Bookmark the permalink.